Posted on March 10, 2014 by Elizabeth E.
I joined Diane’s Selvage Block-A-Long Flickr group some time ago, but didn’t have anything to show off for it. Now I finally have this lovely burst of orange. I used Poppyprint’s tutorial, figuring “Why reinvent the wheel and make my own?” as hers was perfectly lovely. I did draw two more lines on either side of the middle diagonal, and it did help keep me on track (try not to find where I went haywire). And I found that using pins was also helpful to keep the selvages from shifting. 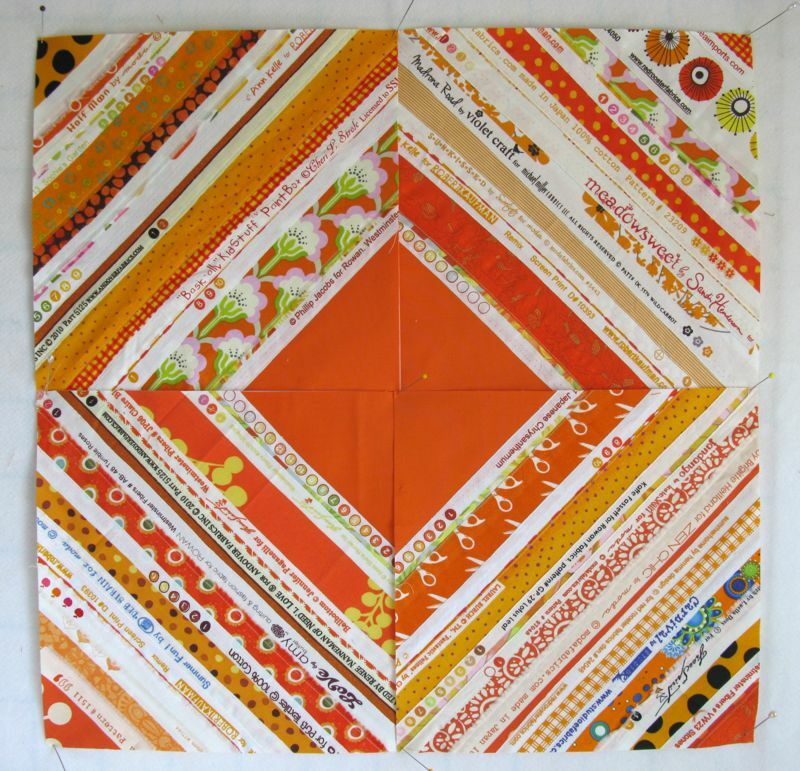 I use vellum paper, still leftover from Come-A-Round’s marathon of paper piecing a couple of years back, gluing on a side strip to widen the 8 1/2″ to 10,” making it all nice and square. True Confession: I didn’t have this many orange selvages in my pile, so YES, I did head to the stash, pulling and cutting to make more. If you cut them with at least one inch ABOVE the white selvage line, you’ll be a happier piecer. I also had chance to finish up the February Block for the Always Bee Learning Bee. She meant to send out the fabric several times, but her family has had a bad winter of flu and yuck, so we received it last week, and I got it out the door today. I’m not making progress on my List of Goals, instead, I write the new project on, then cross it off. Is that cheating? Here’s one that was written on recently: Rainbow Petals. I went and found all the greens I could in my LQS, cut and shaped petals and stuck them on. Which one would you choose? Right. Me neither. So I went back to my stash and tried to find colored petals that would be slightly darker, yet a blend of the two adjacent petals. I had some successes, but going around to fabric stores to find just the right color may take a while. Better move this one off the First Quarter Goal Sheet and on to the second. And really, since it is the 10th already, there may be a few more projects moving forward, given that Spring Break is coming up, I might have visitors, and that the essay on Short Stories is coming in on Thursday. I save some selvage strips but they never have much of the actual fabric left on them. Im too stingy with my fabric I guess. Like the darker solids in the second photo. 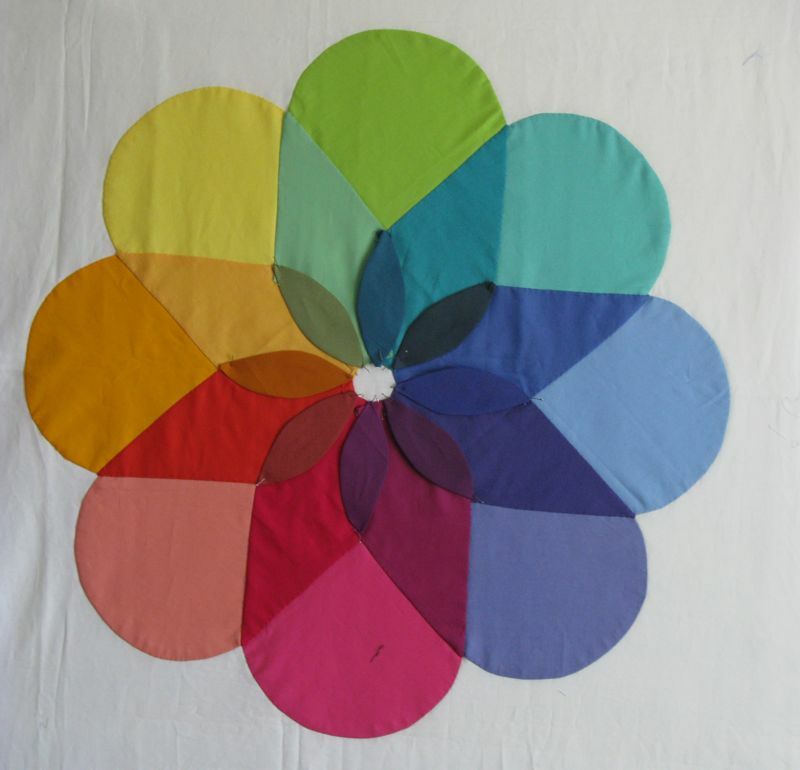 It’s always such a tough call on solids when you don’t have color cards of every manufacturer’s colors. Wish I did. Right after I finally broke down and got a Kona card they came out with new colors. Now I’m two new color grouping s behind. Sometimes I buy a charm pack and use it like a set of swatches. Of course they don’t show the color name so I try my best to figure it out and put a label on each one. Enjoy your spring break and company. Lastly . . . Love that saying. If only I was better at time management. Not my strong point. 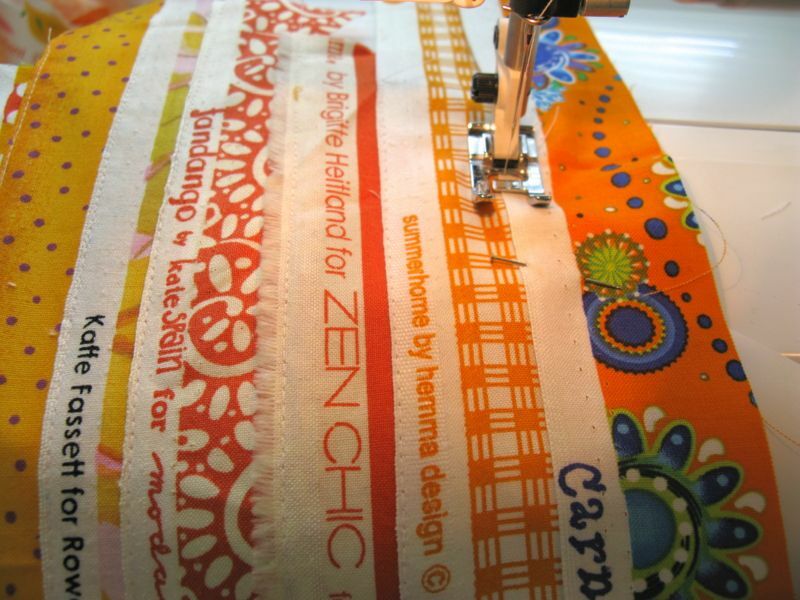 I have a bit of a ‘love/hate’ relationship with selvedges (and my spelling of the word too!) I’m like Anne, cutting only enough off to discard them and not making them worth keeping! I do love your Petals and admire the lengths you are going to to find the ‘just right’ colour! Good luck with the grading! At this time of term for me, it feels never ending! I love the selvage block! What a great way to salvage selvages. 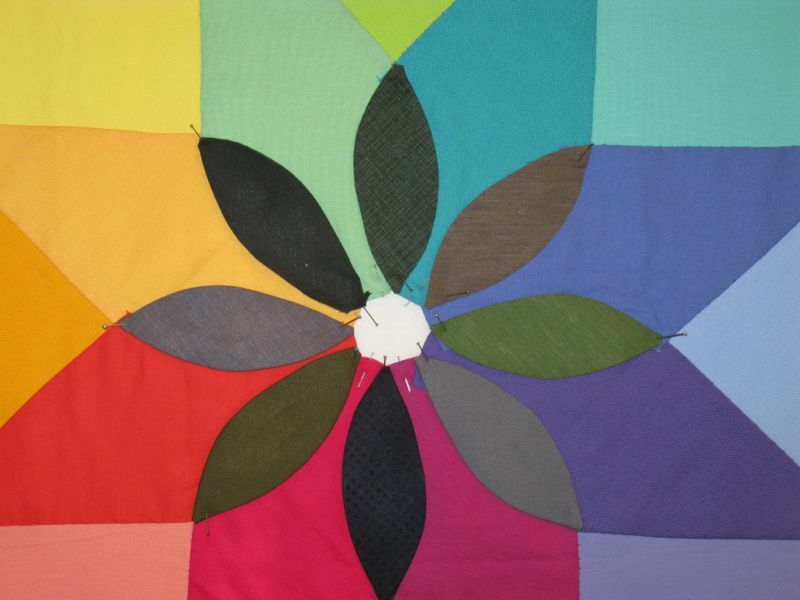 i think you are on the right track with that petal block….so pretty! Like you i like to cut 1 inch of print with my selvage trimming. 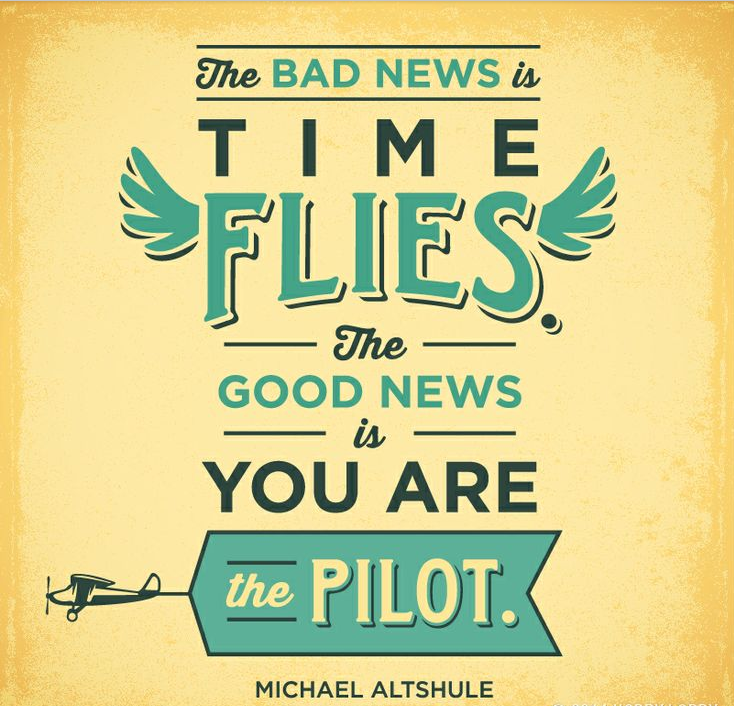 The quotation is fun, and I think adding the new project and crossing it off is a good way to be pilot.As to the rainbow bloom second shot: I like the small petals when they are darker than the large, but not when they blend and disappear. What would happen if you switched to light on dark? Love your selvage work! Once I realized you could make something out of them, I’ve been saving (and stalking good) selvages for years – haven’t done anything with them yet, but the time is coming! And your determination with the Rainbow Petals is admirable – cannot wait to see how it materializes! Enjoy your break – well deserved! 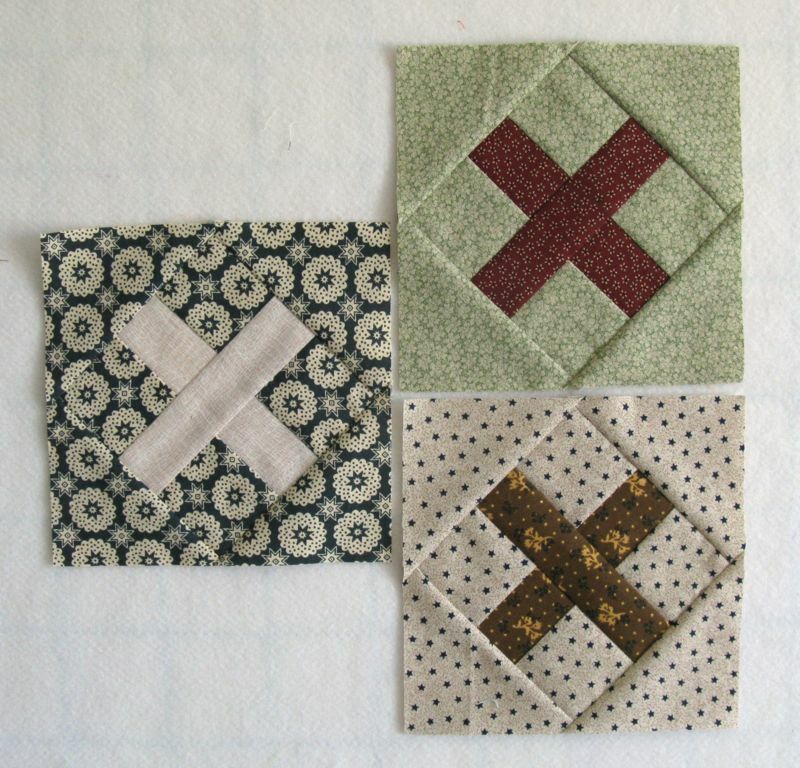 I LOVE the solid centers in those selvage blocks!!! Those look fabulous. Good luck with finding the right fabrics for the petals. I kmow it will look great when you finish it. Thanks for the shout out on the selvage tutorial! 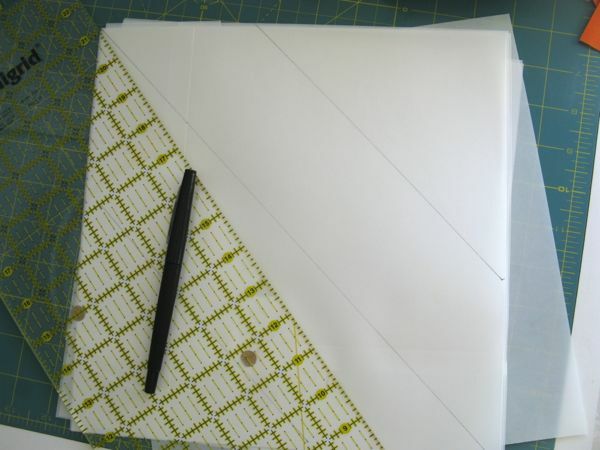 I see that one of the comments suggests muslin – I chose not to use muslin because I knew my quilt was going to end up being at least 70″ square and I didn’t want the added weight of a third layer of fabric since I’d like to quilt it myself. I left a note on your flickr picture about the foundation paper – I removed the paper before piecing the blocks and I think that was a mistake. The edges are so stretchy on the bias that they would have been much easier to sew together if I’d left the paper on. Good luck with yours! I’m working on borders now and hope to have the whole top together this week.